They're all here: Hawkeye bows, Iron Man repulsors, Hulk hands, Mjolnir, even Wolverine claws. So why is it when it comes to the leader of the Avengers we keep getting these let down products?! 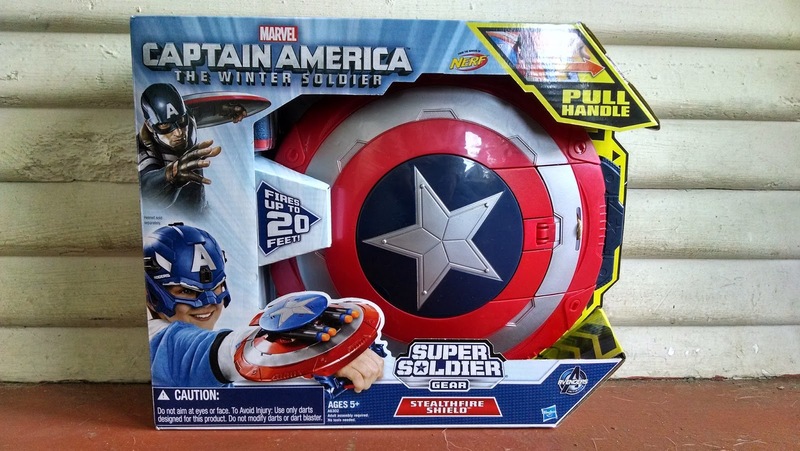 Ok, aside from the lack of Black Widow's "stingers" (which I'm hoping the Rebelle line will fix) we've been pretty absent of any Nerf related merchandise for one key member in particular: the Star-Spangled Avenger! 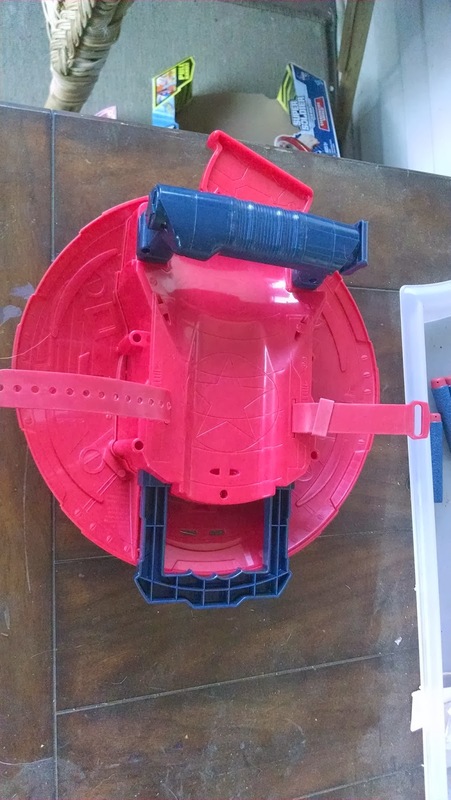 Sure, we've had some non-Nerf products, like the Triple Blast Shield, and the Disc Launching Shield, but nothing more directly compatible with Nerf products. I mean, we had stuff like that for the other heroes, but we've finally been seeing some cross promotion with some of these blasters, albeit in a very kid friendly form: they're tiny. Full review and YouTube firing video after the break. Now, I've heard good things about the Iron Man Gauntlet, and the Big Bad Bow for Hawkeye is really just a re-purposed Nerf blaster that already exists with a new paint scheme. The Longbow is tiny, but actually packs quite a punch. The other products are more akin to the N-Force line, Hulk hands, Mjolnir (Thor's Hammer for the uniformed) and even Wolverine's claws are all something I can see both kids and adults enjoying in their Nerf wars. They either shoot regular elite streamlines, or they are the same foam we've come to expect from Nerf's melee lineup. Plus, they all represent their hero's namesake pretty well. No so with the Stealthfire Shield. It fails in pretty much every way possible. 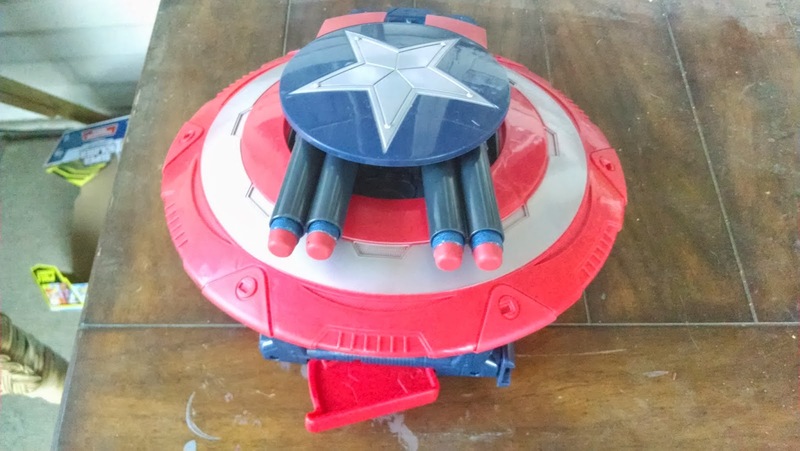 It's not an effective blaster, it's not an effective shield, and it really doesn't capture Captain America all that well. Lets start with ranges, the box advertises 20 feet. WOW. 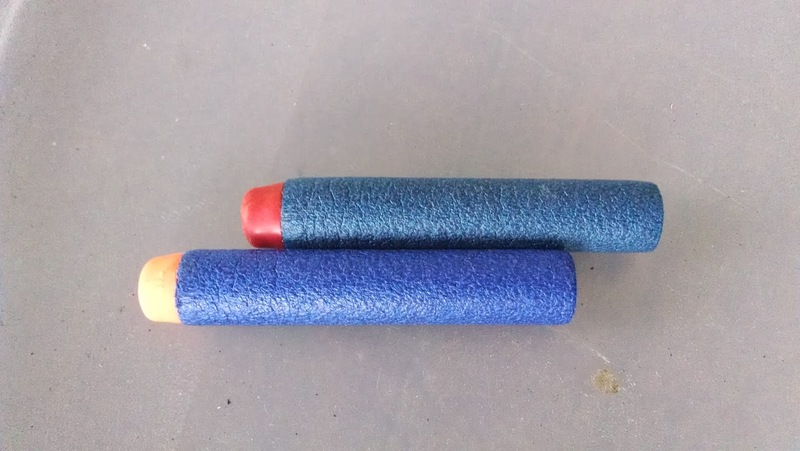 That's abysmal, and if I know Nerf what it states for ranges is generally exaggerated upon by the ranges being measured at a slight angle when fired. However, my testing of the Hawkeye Longshot Bow left me pleasantly surprised, it was hitting and exceeding it's advertised 40 feet. Maybe Nerf was just trying to lure in parents who were overly cautious of blasters they might think were too powerful. Nope, it's business as usual with this guy. I was getting between 15-18 feet. YIKES! That's abysmal! I get gimmick blasters, I really do, but this.... This was a step beyond! First off I'll say I didn't have any problems with the shield fitting around my wrist, Hasbro must be expecting some big kids to be playing with this because I was on one of the lowest settings. This is strange because I have small hands so I expected it to fit on my wrist, but I expect some people with larger hands will have some problems with the handle/trigger/priming mechanism as well as the bar in the back you have to pull to activate the blaster. Yeah, it's weird. 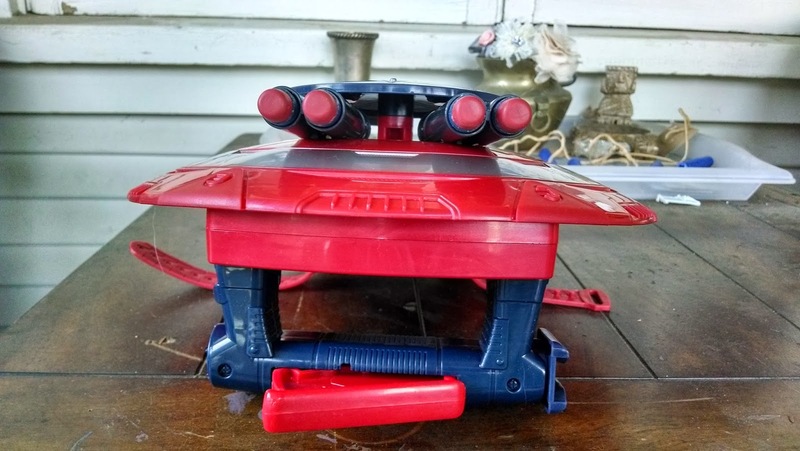 You load up the blaster by flipping down the rear of the shield. then you basically can use it as a shield until you need a surprise attack (I guess?). You pull a lever..thing in the back by where you loaded it to reveal twin howitzers that flip around to attack your enemy! Ok, I'm exaggerating again, but it does evoke a battleship-esque feeling when the barrels flip around to face front. It's like a bit adapter.. So, here's the kinda weird thing. It doesn't need to be primed. You pull the trigger mech and it fires. That's it. 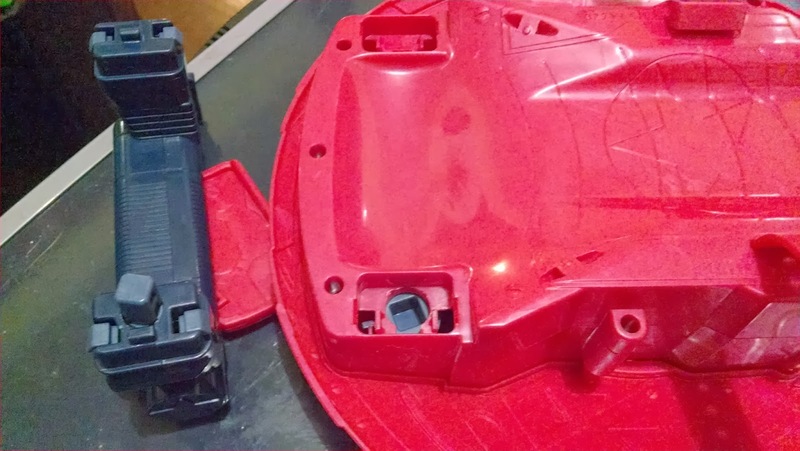 After it fires all the darts, the fifth shot closes the blaster back up into shield mode. As you can see in the picture the trigger as to be snapped into place on the blaster. A square peg rotates and presumably is what causes the blaster to close after four shots. Thanks man, we'll try to keep 'em coming!